"Australian Voices is the series of concerts that really means the most to me at ANAM. As a dedicated support of my fellow Australian composers and Australian music in general, it is really important that we build a repertoire from our great legacy and the way to do that is fill the hearts, minds and fingers of our next generation of superstars with this music. In a generation or two, we will have an Australian repertoire." says Paul Dean. Of this particular concert he expands, "These Sculthorpe pieces have a special place in my heart. 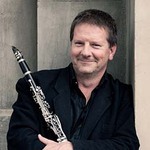 My teacher was the first Australian to play Songs of Sea and Sky, and it really stands at the pinnacle of Australian clarinet music for its beauty, and beguiling sonorities. Tabuh Tabuhan is a piece I have played many times including several times in the presence of the composer. In fact, the last time we were together I was talking to Peter about the mistakes in the new score and I at last have an excuse to revisit the work with both my scores (old and new) and correct the new one so performances in the future can be much more as Peter wanted them. And the 8th quartet, well, a true Australian icon."